So it is over for another year. As ever there has been fierce debate in the office over who should and should not have been awarded which medals and whether some were overlooked. And as ever I am the one writing the blog my opinion is the right one, no matter what anyone else may tell you! Anyway, there were awards a-plenty this year, some we were all expecting, others more surprising and a couple of disappointing results as well. Here are a few of the most interesting we’ve been squabbling about here. The show gardens were a little bit of a mixed bag I reckon with some interesting designs, new planting, innovative use of materials but universally superb quality. 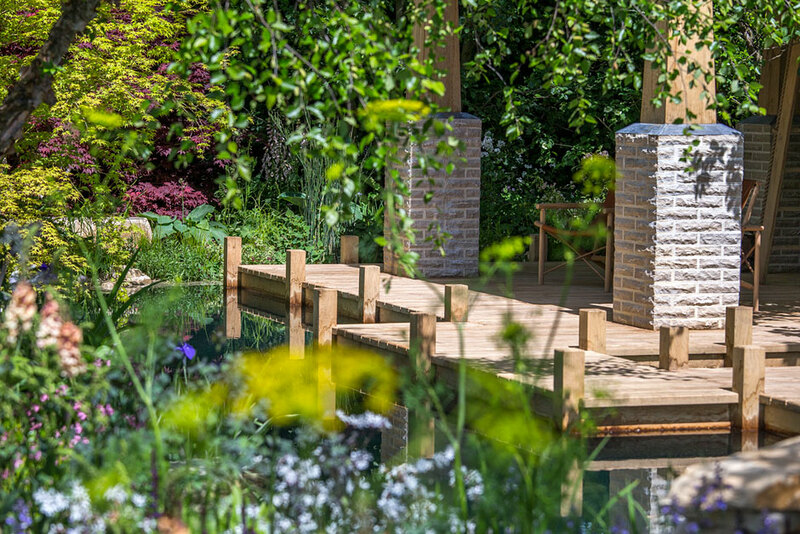 Jo Thompson’s delightful M&G garden with its balance of planting and water was sublime. I have to say the fact this didn’t receive a gold medal was the travesty of the show. The planting was wonderful, the atmosphere created by the garden transformative, the overall design was superb, the two storey oak framed building designed after Vita Sackville-West’s writing room simply perfect it added a air of theatre to the design. the wonderfully planned out pond, complete with water planting and wildlife that you can swim in! I would move into that garden if given half a chance. 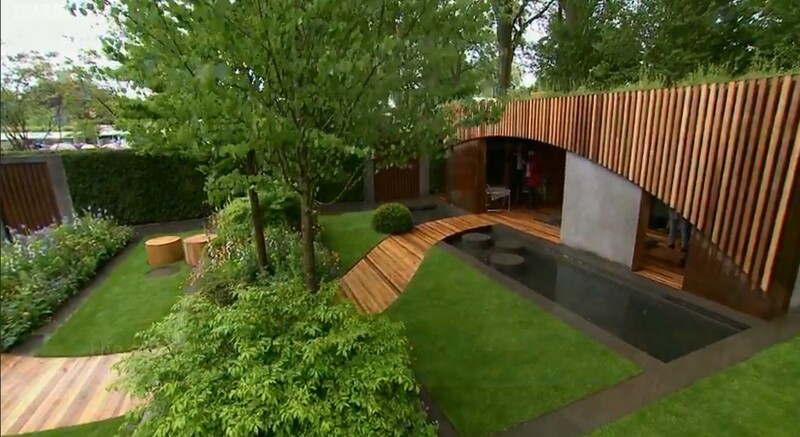 The wonderful attention to detail of Adam Frost’s Homebase ‘Urban Retreat’ garden. The overall design looked at a glance to be simple but as you studied it, the clever use of repeated shapes and form was inspiring. I particularly liked the shapes he created both vertically and horizontally in his hard landscaping. The use of the cedar and the great colour combinations of soft orange and purple and cerise and china blue was sublime. I have admired Adam for so long and cannot believe it is the last time we will see him at Chelsea. Ishihara Kazuyuki’s garden ‘Edo no Niwa’ was superb. As usual the garden looked like it had been there for years but the structure and balance of this little garden was truly mesmerising. The juxtaposition of the rushing water and the soft, serene acers was so clever. 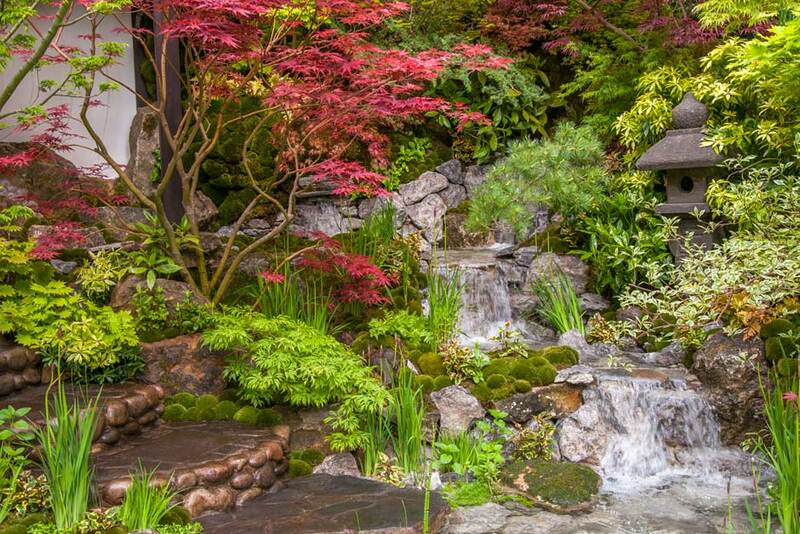 What else stands out – the mosses, the careful selection of the stone and that Bonsai tree – this was the work of a genius. And did the colour of his bow tie influence the judges! 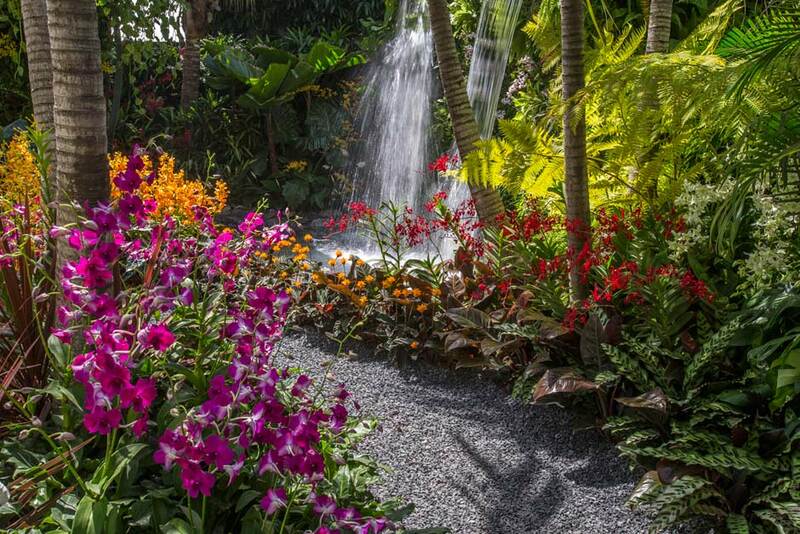 The tropical garden designed by John Tan & Raymond Toh was wonderful. The cascades of water and the dense planting transported you into a very different habitat. Having visited gardens in Singapore many times, it really did reflect this part of the world. The only thing I didn’t really like was the grey gravel, but the vibrant greens and pinks alongside the fiery oranges and scarlets were really exciting. The centrepiece had to be the water though. That was brilliant! It’s always good to see newcomers at Chelsea, less common to see designers nail it first time. 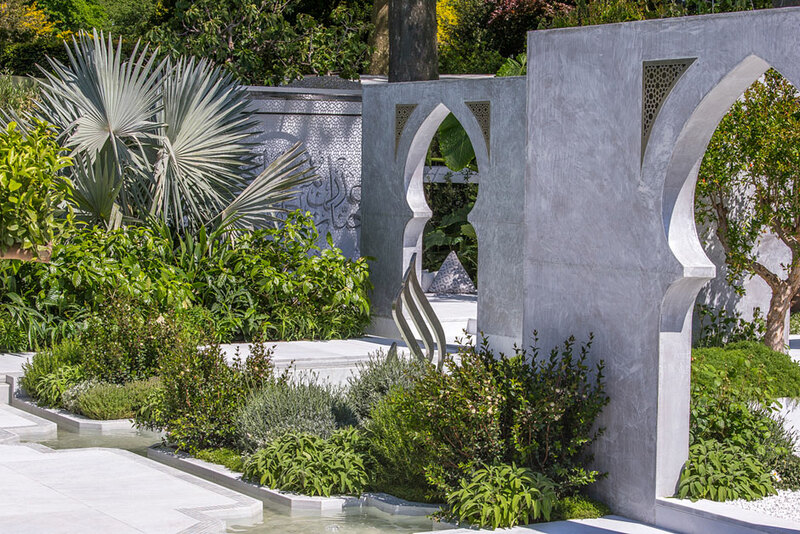 Recent years have seen an increase in the number of successful newcomers and this year is no exception with Kamelia Bin Zaal’s ‘Beauty of Islam’ garden. This was one of our favourites, and even more notable was that the Accent team all agreed on that. The architectural design of it was gorgeous, the understated planting perfect for the setting and the use of water inspired. Why didn’t it get a gold you ask? Well Kamelia did fall into that old Chelsea trap of having a higher hard landscaping to planting ratio than the judges like, sure it worked with the design and met the brief but this is the Chelsea Flower Show after all. Still, a resounding success for a first year contender and we look forward to even greater showings in the future. It came as little surprise to see Dan Pearson’s epic tribute to Chatsworth Gardens getting the top spot this year. The garden inspired by Dan’s love for all things natural and “timeless” evokes the feeling of a centuries old landscape, complete with lichens, mosses and aged stones. After it’s well deserved victories at Chelsea it has been dismantled and transferred back to Chatsworth where it will be made into a permanent installation. The debate of whether this was a garden or a stage set is debatable but whatever, a masterpiece. With regards to L’ Occitane Perfumers Garden in Grasse by James Basson, now this one has caused some controversy here. Some say it is an elegantly rustic piece, perfectly designed to combine the very controlled and incredibly powerful aromas of the plants with the all encompassing beauty of nature itself. Personally I think it’s a great big mess. The idea seems solid, a classic French perfumers garden being reclaimed by nature and therefore bridging the gap between the designed and the divine but to be honest it looks like a well appointed perfumers garden that has been left to become overgrown by weeds. The planting, at least of the fragrant plants, is very well done and you do feel truly uplifted in walking through it, based on smell alone. Still, I can’t help feeling that mother nature would have done better to keep her hands to herself on this one. Do I dislike it? No. But it just didn’t wao me as much as some of the others did. Right let’s start arguing over next year’s show ….